Son of a gun we’ll have big fun on the Bayou, only this son of a gun is the offspring of the legendary Kawasaki Z1 and the Bayou is replaced by the historic streets of Ljubljana, Slovenia. 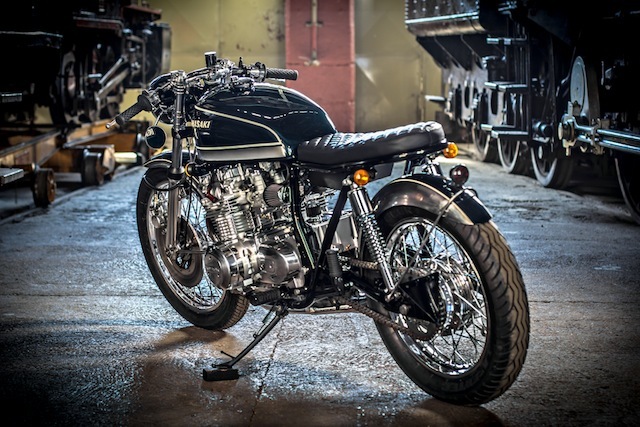 Built by Krakenhead Customs this is a daily rider that pays homage to the golden years of Kawasaki’s Z bikes that along with Honda’s CB series introduced the world to 4 cylinders across the frame, big disc front ends and became the inspiration for all modern sports bikes. 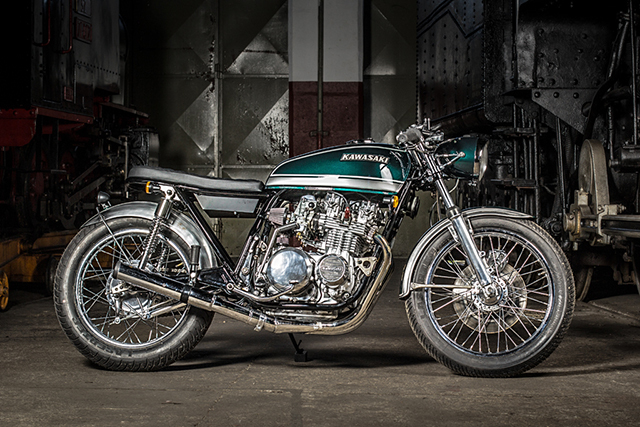 This son of a Z1 is a 1976 Kawasaki KZ 650 B1 that had spent its past 13 years abandoned and unloved in a Slovenian barn. 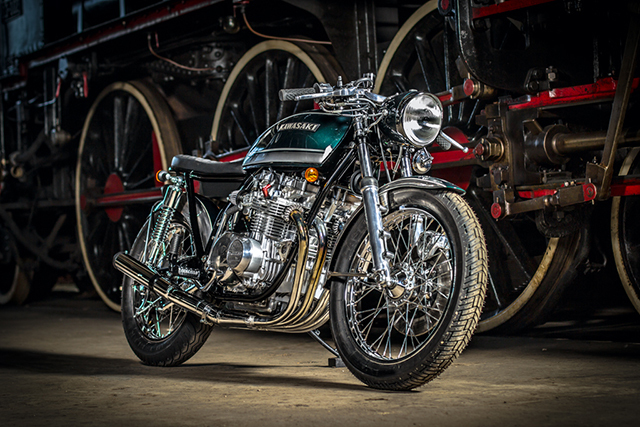 Green Glory as it is known was built with the inspiration of those glory years in mind, but with enough custom touches to show the world just what Krakenhead Customs can do and key to the build, it had to remain roadworthy. The entire frame was cleaned up and a new rear hoop added to be able to mount the seat they had in mind. Slight tweaks were made to the geometry and new shock mounts fabricated before the whole thing was painted black. 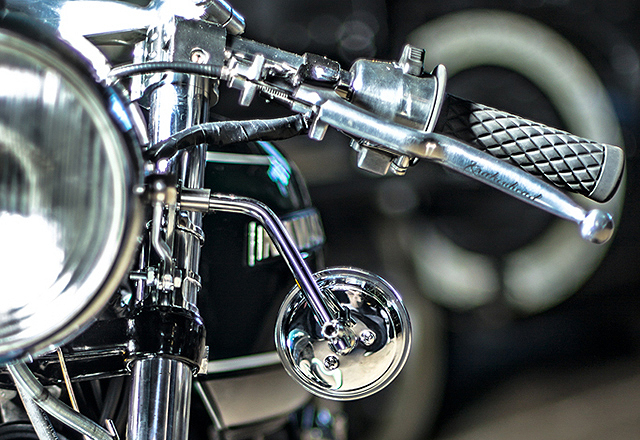 Mounted to those new shock points are a set of longer chrome shocks that give the bike a far more aggressive stance. Further bringing the Z closer to terra firma are the lowered front shocks that were then treated to polished legs. Needing a rear fender to remain roadworthy but not wanting to lose that under seat space that shows off the raised rear, Luka and the team made the decision to create a fender that rides close to the tire just like the front end. Custom brackets hold it all in place and modifications were cleverly made to ensure it never fouls the tyre even on the hardest of bumps. All the vital engine parts have been overhauled or renewed to bring the 650 back to its former glory. The baby Z was a quick bit of kit back in the 70’s, capable of 12 second quarter miles that left almost every other middleweight bike well and truly in its dust. Adding a few more ponies are the fitment of the stunning Marving 4-1 exhaust and K&N filters. The whole engine was thoroughly cleaned and detailed, while the side covers are heavily polished. Further cleaning up the look of the Z is the under seat box that holds all the wiring and other miscellaneous objects that would otherwise clutter the clean lines of the bike. The standard braking was fairly capable in its day but giving the rider extra confidence are master cylinder and levers that come from a Suzuki GSXR 1000. Having polished the fork legs and the side covers it was hard not to go further, so the same treatment was given to the triple trees, wheels, switch blocks and clip ons. While further individualising comes in the way of engraved Krakenhead logos that have been neatly carved into the levers and the tank cap. 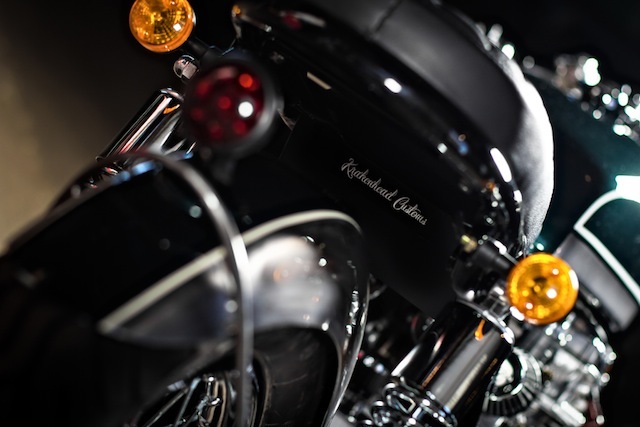 Beautifully offsetting all the polished metal is the one off leather seat that is both stylish and comfortable enough for daily duties. 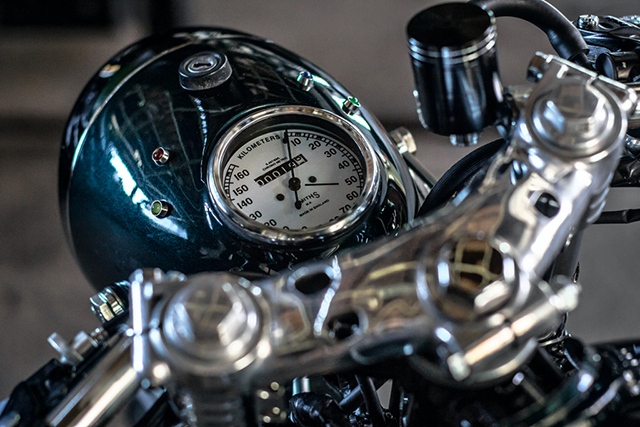 All Krakenhead builds now and into the future receive one signature item, the “Kraken” headlamp, taken from the NSU Supermax they are then modified to fit the application before receiving a Royal Enfield speedo and idiot lights for functionality. But it’s hard to look at this build for any length of time and not be truly impressed by the paint work. Just like the rest of the build it pays homage to the golden days of Z bikes but with a Krakenhead twist. Green Glory had to follow the Z1 green paint scheme so the tank and rear fender were first coated in the classic Kawasaki green but with a candy effect. The Z fading grey belt is perfectly replicated on the tank and the white pin striping is all done by hand. While the rear fender has its sides left in brush metal, finished in clear coat to protect it from the elements. 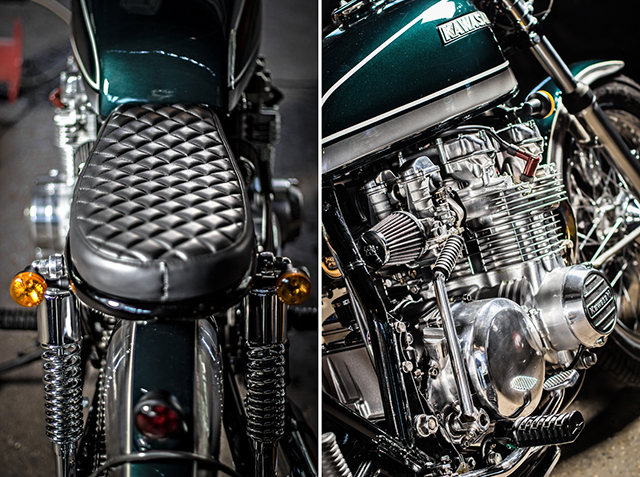 With the KZ650 build a huge success Krakenhead customs have already started work on a radical overhaul of a KZ 1000 and Honda GL 1000 and if Green Glory is anything to go by the streets of Ljubljana are set for a wild ride!